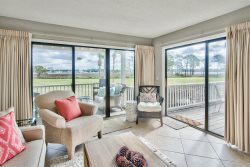 Here’s a Bayside Sandestin vacation rental inside Sandestin Golf and Beach Resort, surrounded by ponds and the Links golf course. And best of all, the sandy beach is not far away. A fun-filled day here in Sandestin can include exploration of nearby Jolee Island Nature Park and Baytowne Marina, as well as a walk along the most beautiful beaches on the Florida Gulf Coast. At Jolee Island, stop for a nature walk and picnic and enjoy the native flora and fauna. Spend time at the Baytowne Marina and watch fishing boats return with their catch. Rent kayaks, stand up paddle boards or a pontoon boat for a self guided tour of our unique tropical ecosystem. Spend your afternoon relaxing on your first floor patio, enjoying the views of Sandpiper Lake. Make your way into the kitchen to whip-up a quick snack or cold beverage. With plenty of counter space, coordinated appliances and great storage, you will be able to comfortably prepare, serve and entertain your group from your fully equipped. You’ll sleep well in the very comfortable king size bed found in the large Master Bedroom, and equally well in the Second Bedroom king bed and twin beds in the third bedroom. Each bedroom hosts a TV, perfect for winding down with a movie or something from your favorite streaming media delivered over WiFi. Fee-based resort activities available- golf, tennis, rentals, spa, fitness center. The property was very clean and quiet. It had everything we needed and more will book again. We had a wonderful time with 2 adults, 2 grandparents and 2 young children. The house had everything we needed, the view of the lake was amazing, and the location was great! Would definitely stay here again! I traveled with a family of eight ranging in age from 12 - 73 years old. This rental provided plenty of space, comfort, and privacy for all of our travelers. Everyone loved the house, and the location was perfectly situated with easy access to the beach and shopping. I had a few questions for the owners when we arrived, and Lauren was very helpful. I would definitely recommend this rental to others, and request it again for me and my family. We thoroughly enjoyed our stay in Sandestin. The unit location was perfect....close enough to the beach, yet secluded and quiet. It was nicely decorated and well stocked. We love the Sandestin Resort and will be back.